If it sounds like we’re repeating ourselves, it’s because we are. For the proverbial umpteenth time, Fact Checkers at a prominent newspaper have denounced a lie being told by a supporter of expanded background checks on gun sales. 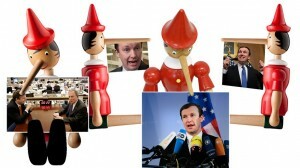 On Monday, the Washington Post gave Four Pinnochios to U.S. Sen. Chris Murphy (D-Conn.) for repeating a claim originated by Michael Bloomberg’s Everytown for Gun Safety group, that there has been an average of one school shooting per week since the December 2012 crime at Sandy Hook Elementary School in Newtown, Connecticut. “Applying a reasonable person standard” to what should be considered a “school shooting” in the context of the Sandy Hook crime, the Post concluded that of 126 incidents on Everytown’s list, most were suicides or attempted suicides, accidents, or shootings resulting from arguments between individuals, and perhaps only 10 were crimes in which someone intended to shoot multiple people.